Themes are the fundamental and often universal ideas explored in a literary work. We give you a summary of themes for this book Things Fall Apart to guide you in your school work and other project concerning the book. As a story about a culture on the verge of change, Things Fall Apart deals with how the prospect and reality of change affect various characters. The tension about whether change should be privileged over tradition often involves questions of personal status. Okonkwo, for example, resists the new political and religious orders because he feels that they are not manly and that he himself will not be manly if he consents to join or even tolerate them. To some extent, Okonkwo’s resistance of cultural change is also due to his fear of losing societal status. His sense of self-worth is dependent upon the traditional standards by which society judges him. This system of evaluating the self inspires many of the clan’s outcasts to embrace Christianity. Long scorned, these outcasts find in the Christian value system a refuge from the Igbo cultural values that place them below everyone else. In their new community, these converts enjoy a more elevated status. The villagers in general are caught between resisting and embracing change and they face the dilemma of trying to determine how best to adapt to the reality of change. Many of the villagers are excited about the new opportunities and techniques that the missionaries bring. This European influence, however, threatens to extinguish the need for the mastery of traditional methods of farming, harvesting, building, and cooking. These traditional methods, once crucial for survival, are now, to varying degrees, dispensable. 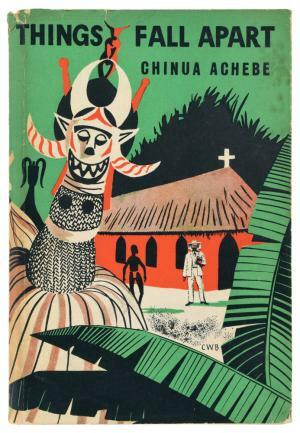 Throughout the novel, Achebe shows how dependent such traditions are upon storytelling and language and thus how quickly the abandonment of the Igbo language for English could lead to the eradication of these traditions. Okonkwo’s relationship with his late father shapes much of his violent and ambitious demeanor. He wants to rise above his father’s legacy of spendthrift, indolent behavior, which he views as weak and therefore effeminate. This association is inherent in the clan’s language—the narrator mentions that the word for a man who has not taken any of the expensive, prestige-indicating titles is agbala, which also means “woman.” But, for the most part, Okonkwo’s idea of manliness is not the clan’s. He associates masculinity with aggression and feels that anger is the only emotion that he should display. For this reason, he frequently beats his wives, even threatening to kill them from time to time. We are told that he does not think about things, and we see him act rashly and impetuously. Yet others who are in no way effeminate do not behave in this way. Obierika, unlike Okonkwo, “was a man who thought about things.” Whereas Obierika refuses to accompany the men on the trip to kill Ikemefuna, Okonkwo not only volunteers to join the party that will execute his surrogate son but also violently stabs him with his machete simply because he is afraid of appearing weak. Okonkwo’s seven-year exile from his village only reinforces his notion that men are stronger than women. While in exile, he lives among the kinsmen of his motherland but resents the period in its entirety. The exile is his opportunity to get in touch with his feminine side and to acknowledge his maternal ancestors, but he keeps reminding himself that his maternal kinsmen are not as warlike and fierce as he remembers the villagers of Umuofia to be. He faults them for their preference of negotiation, compliance, and avoidance over anger and bloodshed. In Okonkwo’s understanding, his uncle Uchendu exemplifies this pacifist (and therefore somewhat effeminate) mode. Language is an important theme in Things Fall Apart on several levels. In demonstrating the imaginative, often formal language of the Igbo, Achebe emphasizes that Africa is not the silent or incomprehensible continent that books such as Heart of Darkness made it out to be. Rather, by peppering the novel with Igbo words, Achebe shows that the Igbo language is too complex for direct translation into English. Similarly, Igbo culture cannot be understood within the framework of European colonialist values. Achebe also points out that Africa has many different languages: the villagers of Umuofia, for example, make fun of Mr. Brown’s translator because his language is slightly different from their own. On a macroscopic level, it is extremely significant that Achebe chose to write Things Fall Apart in English—he clearly intended it to be read by the West at least as much, if not more, than by his fellow Nigerians. His goal was to critique and emend the portrait of Africa that was painted by so many writers of the colonial period. Doing so required the use of English, the language of those colonial writers. Through his inclusion of proverbs, folktales, and songs translated from the Igbo language, Achebe managed to capture and convey the rhythms, structures, cadences, and beauty of the Igbo language. The concept of chi is discussed at various points throughout the novel and is important to our understanding of Okonkwo as a tragic hero. The chi is an individual’s personal god, whose merit is determined by the individual’s good fortune or lack thereof. Along the lines of this interpretation, one can explain Okonkwo’s tragic fate as the result of a problematic chi—a thought that occurs to Okonkwo at several points in the novel. For the clan believes, as the narrator tells us in Chapter 14, a “man could not rise beyond the destiny of his chi.” But there is another understanding of chi that conflicts with this definition. In Chapter 4, the narrator relates, according to an Igbo proverb, that “when a man says yes his chi says yes also.” According to this understanding, individuals will their own destinies. Thus, depending upon our interpretation of chi, Okonkwo seems either more or less responsible for his own tragic death. Okonkwo himself shifts between these poles: when things are going well for him, he perceives himself as master and maker of his own destiny; when things go badly, however, he automatically disavows responsibility and asks why he should be so ill-fated. In their descriptions, categorizations, and explanations of human behavior and wisdom, the Igbo often use animal anecdotes to naturalize their rituals and beliefs. The presence of animals in their folklore reflects the environment in which they live—not yet “modernized” by European influence. Though the colonizers, for the most part, view the Igbo’s understanding of the world as rudimentary, the Igbo perceive these animal stories, such as the account of how the tortoise’s shell came to be bumpy, as logical explanations of natural phenomena. Another important animal image is the figure of the sacred python. Enoch’s alleged killing and eating of the python symbolizes the transition to a new form of spirituality and a new religious order. Enoch’s disrespect of the python clashes with the Igbo’s reverence for it, epitomizing the incompatibility of colonialist and indigenous values. Achebe depicts the locusts that descend upon the village in highly allegorical terms that prefigure the arrival of the white settlers, who will feast on and exploit the resources of the Igbo. The fact that the Igbo eat these locusts highlights how innocuous they take them to be. Similarly, those who convert to Christianity fail to realize the damage that the culture of the colonizer does to the culture of the colonized. Okonkwo is associated with burning, fire, and flame throughout the novel, alluding to his intense and dangerous anger—the only emotion that he allows himself to display. Yet the problem with fire, as Okonkwo acknowledges in Chapters 17 and 24, is that it destroys everything it consumes. Okonkwo is both physically destructive—he kills Ikemefuna and Ogbuefi Ezeudu’s son—and emotionally destructive—he suppresses his fondness for Ikemefuna and Ezinma in favor of a colder, more masculine aura. Just as fire feeds on itself until all that is left is a pile of ash, Okonkwo eventually succumbs to his intense rage, allowing it to rule his actions until it destroys him.